^ "Structure-function studies of the RNA polymerase II elongation complex". Acta Crystallographica D. 65 (Pt 2): 112–20. February 2009. doi:10.1107/S0907444908039875. PMC 2631633  . PMID 19171965. ^ "Nucleolus: the fascinating nuclear body". Histochemistry and Cell Biology. 129 (1): 13–31. January 2008. doi:10.1007/s00418-007-0359-6. PMC 2137947  . PMID 18046571. ^ "Cis-acting determinants of asymmetric, cytoplasmic RNA transport". 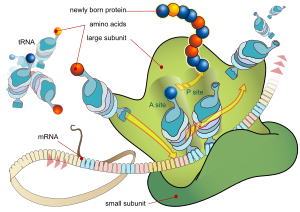 RNA. 13 (5): 625–42. May 2007. doi:10.1261/rna.262607. PMC 1852811  . PMID 17449729. ^ "Maintenance of the correct open reading frame by the ribosome". EMBO Reports. 4 (5): 499–504. May 2003. doi:10.1038/sj.embor.embor825. PMC 1319180  . PMID 12717454. ^ "The concept of translocational regulation". The Journal of Cell Biology. 182 (2): 225–32. July 2008. doi:10.1083/jcb.200804157. PMC 2483521  . PMID 18644895. ^ "The formation and stabilization of protein structure". The Biochemical Journal. 128 (4): 737–49. July 1972. doi:10.1042/bj1280737. PMC 1173893  . PMID 4565129. ^ "RNA misfolding and the action of chaperones". Frontiers in Bioscience. 13 (13): 1–20. January 2008. doi:10.2741/2557. PMC 2610265  . PMID 17981525. ^ "Secretion without Golgi". Journal of Cellular Biochemistry. 103 (5): 1327–43. April 2008. doi:10.1002/jcb.21513. PMC 2613191  . PMID 17786931. ^ "The interplay between transcription factors and microRNAs in genome-scale regulatory networks". BioEssays. 31 (4): 435–45. April 2009. doi:10.1002/bies.200800212. PMC 3118512  . PMID 19274664. 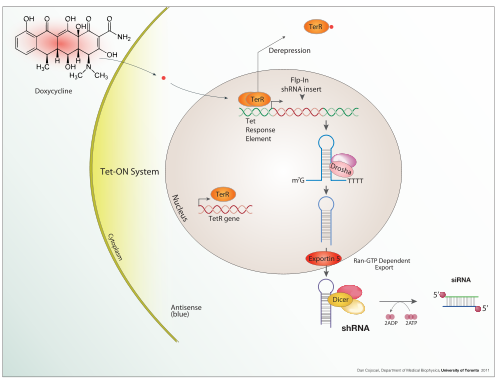 ^ "The Nrf2-antioxidant response element signaling pathway and its activation by oxidative stress". The Journal of Biological Chemistry. 284 (20): 13291–5. May 2009. doi:10.1074/jbc.R900010200. PMC 2679427  . PMID 19182219. ^ "Switching Akt: from survival signaling to deadly response". BioEssays. 31 (5): 492–5. May 2009. doi:10.1002/bies.200900005. PMC 2954189  . PMID 19319914. ^ "A genome-wide analysis of CpG dinucleotides in the human genome distinguishes two distinct classes of promoters". Proceedings of the National Academy of Sciences of the United States of America. 103 (5): 1412–7. January 2006. Bibcode:2006PNAS..103.1412S. doi:10.1073/pnas.0510310103. PMC 1345710  . PMID 16432200. ^ "Cancer genome landscapes". Science. 339 (6127): 1546–58. March 2013. Bibcode:2013Sci...339.1546V. doi:10.1126/science.1235122. PMC 3749880  . PMID 23539594. ^ "MicroRNAs in the DNA Damage/Repair Network and Cancer". International Journal of Genomics. 2014: 820248. 2014. doi:10.1155/2014/820248. PMC 3926391  . PMID 24616890. ^ "A combination of LongSAGE with Solexa sequencing is well suited to explore the depth and the complexity of transcriptome". BMC Genomics. 9: 418. September 2008. doi:10.1186/1471-2164-9-418. PMC 2562395  . PMID 18796152. ^ "The incredible shrinking world of DNA microarrays". Molecular bioSystems. 4 (7): 726–32. July 2008. doi:10.1039/b706237k. PMC 2535915  . PMID 18563246. ^ "High-resolution mapping of plasmid transcriptomes in different host bacteria". BMC Genomics. 10: 12. January 2009. doi:10.1186/1471-2164-10-12. PMC 2642839  . PMID 19134166. ^ "Annotating genomes with massive-scale RNA sequencing". Genome Biology. 9 (12): R175. 2008. doi:10.1186/gb-2008-9-12-r175. PMC 2646279  . PMID 19087247. ^ "The Gene Expression Omnibus Database". Methods in Molecular Biology. 1418: 93–110. 2016. doi:10.1007/978-1-4939-3578-9_5. PMC 4944384  . PMID 27008011. ^ "CollecTF: a database of experimentally validated transcription factor-binding sites in Bacteria". Nucleic Acids Research. 42 (Database issue): D156–60. January 2014. doi:10.1093/nar/gkt1123. PMC 3965012  . PMID 24234444. Halaman ini terakhir diubah pada 16 Februari 2019, pukul 04.58.